Alaska Native News Nov 17, 2014. The five-day eruption of Pavlof, on the left flank of the bay with the same name in the Aleutians, has ramped down and is now been downgraded to “orange” after one day being at “red” as of Sunday. On Saturday, the activity at the volcano escalated quickly with a plume of ash that ascended to over 25,000 feet early Saturday morning, then exceeding 35,000 feet by afternoon. A foretelling of increased activity could be seen earlier in the week as lava began “fountaining from a vent just north of the summit, and flows of rock debris and ash <began> descending the north flank of the volcano.” But, by 7 pm, seismic tremors abruptly decreased at the volcano site. The Observatory warned that ash may fall on the communities of Cold Bay, Sand Point, Nelson Lagoon, and King Cove as ash production from the volcano increased, but as of Sunday, no ash fall has been reported. Easterly and southeast winds have served to keep the ash from those communities and instead has moved the ash over the Bering Sea. Winds are expected to continue to blow in the easterly direction for at least the next couple of days. 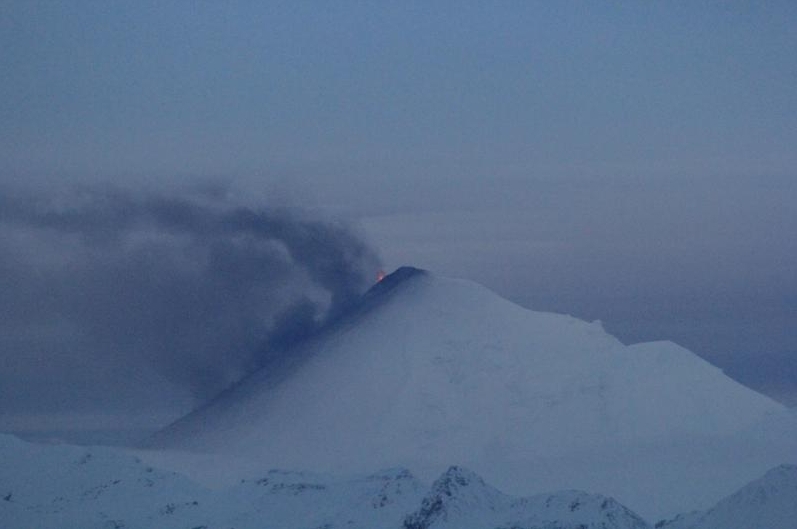 This current eruption is the first since Pavlof ended its previous eruption in late July of this year. The Alaska Volcano Observatory warns that increased activity at the volcano can begin again with little or no warning.